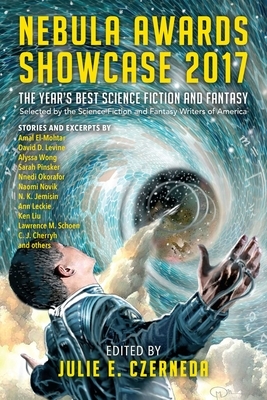 The Nebula Awards Showcase volumes have been published annually since 1966, reprinting the winning and nominated stories of the Nebula Awards, voted on by the members of the Science Fiction and Fantasy Writers of America (SFWA). This year's editor, selected by SFWA's anthology Committee (chaired by Mike Resnick), is Canadian science fiction and fantasy writer and editor Julie Czerneda. This year's Nebula Award winners are Naomi Novik, Nnedi Okorafor, Sarah Pinsker, and Alyssa Wong, with Fran Wilde winning the Andre Norton Award for Young Adult Science Fiction and Fantasy Book. Also included in this volume are works by N. K. Jemisin and Ann Leckie. Since 1997, Canadian author and former biologist Julie E. Czerneda has shared her curiosity about living things through her science fiction and fantasy (SF/F), published by DAW Books. Julie has edited or co-edited sixteen anthologies of SF/F, including the Aurora Award-winning Space Inc. and Under Cover of Darkness and, most recently, Science Fiction and Fantasy Writers of America's Nebula Awards Showcase 2017, published by Pyr. She has presented internationally on writing, scientific literacy, and SF in the classroom; produced the award-winning Tales from the Wonder Zone and Realms of Wonder-themed anthologies; and was Toastmaster for Anticipation, the Montreal Worldcon. Julie is presently completing her SF series, the Clan Chronicles, with the final book, To Guard Against the Stars, to be released October 2017. Please visit www.czerneda.com for more. "Each of these tales offers something compelling and the collection will appeal to a wide range of tastes." "The main sense we come away with is that the line between genre and literary fiction is increasingly arbitrary." "There is not a story in the bunch that is not engaging to the reader.... An excellent book for lovers of science fiction."